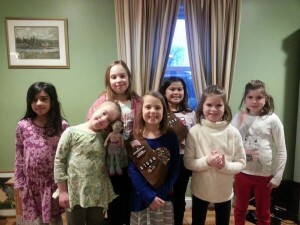 We are a Girl Scout troop in Massachusetts working to earn our WOW -Wonders of Water Journey badges. This is our final project and we have learned a lot on our journey. We want girls around the world to have as much fun as we do because it is not fair that some girls have to spend their time going back and forth for water instead of going to school. 01/21/15 Anonymous $23.00 I am so very proud of you Rach!! May your desire to help others last a lifetime! Love you! 01/19/15 Kathleen Prefontaine $25.00 Great project, girls!! 01/19/15 Maureen & Pat Dunne $46.00 Great project, Nora, Maggie and fellow Scouts!! 01/19/15 Maureen And Pat Murphy $46.00 Great job, Ladies! We believe in the cause!! Nice! 01/19/15 Lesley Elias $10.00 Great project - good luck, girls! 01/19/15 Mary Jane Gangi $20.00 Good luck girls. What an awesome thing to do. 01/19/15 Heather Garbitt $10.00 Great job girls! 01/19/15 Jessica Therivel $23.00 Go Maggie and Nora!!!! 01/18/15 Anonymous $15.00 Go Jenny and friends! Nice work! 01/18/15 Marian Sheeran $10.00 Hi Rachel! Keep up the good work!